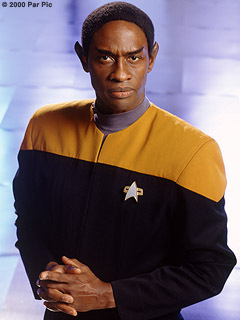 Commander Tuvok, played by Tim Russ, is Voyager's Chief Tactical Officer. He is Vulcan and a disciplined practicioner of the Kolinahr. Tuvok has a time-tested friendship with Captain Janeway and frequently acts as her moral compass. He left behind his wife, T'Pel, and four children in the Alpha Quadrant. He is an invaluable member of the crew, and his tactical expertise has pulled Voyager from the clutches of one hopeless battle after another. 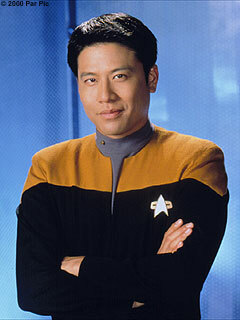 Ensign Harry Kim, played by Garrett Wang, is the Chief Operations Officer. His posting on Voyager was his first assignment upon graduating from Starfleet Academy. Captain Janeway immediately took Harry under her protective wing, and his loyalty to her is absolute. Harry's fiance, Libby, was left behind on Earth. He is close friends with Tom Paris, and the two officers have helped each other adjust to life in the Delta Quandrant. Harry also possesses many engineering skills as well.